BIRMINGHAM – “One Love: The Bob Marley Musical” will premiere at Birmingham Repertory Theatre in the United Kingdom this year. Actor, playwright, broadcaster and singer Kwame Kwei-Armah will direct the musical that he previously wrote and premiered at Baltimore Center Stage, where he is artistic director. Cedella Marley, the reggae legend’s daughter, is elated that the musical will be performed in an area where her famous father had a large following. “On behalf of the Marley family, I am thrilled that our father’s story is going to be brought to the stage with this production,” she said in a statement. Presented in cooperation with the Marley family and Tuff Gong Pictures LP, and developed with the support of Blue Mountain Music, the musical tells the story of Marley’s rise from Third World star to global icon. It also shows his influence in bringing peace to politically divided Jamaica in the 1970s. Bob Marley left Jamaica in December 1976 following an assassination attempt at his St Andrew home. It took place one day before the Smile Jamaica concert in Kingston, where he was the headline act. Marley, his wife Rita and manager Don Taylor were shot. After the show, he and his Wailers band left Jamaica for London, where he spent almost two years in self-imposed exile. 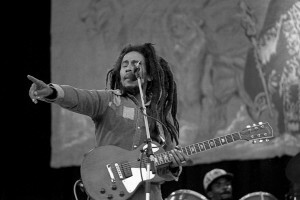 During this period, Marley recorded the Exodus and Kaya albums. The former, released in 1977, stayed in the British album charts for 56 consecutive weeks and was named Best Of The Century by TIME Magazine in 1999. In 1978, Marley returned to Jamaica, where the political situation had deteriorated, to perform the One Love Peace Concert. During the performance, at the insistence of Marley, the leaders of the two opposing political parties came on stage, where he joined their hands in symbolic unity, “resulting in a transformative moment in the history of the country’s difficult political journey,” according to Playbill. One Love: The Bob Marley Musical is presented by the Birmingham Repertory Theatre Company in association with Playful Productions and Stage Play Limited. It will begin performances March 10, 2017, at Birmingham Repertory Theatre for a run through April 8.